The RV-Dreams website has developed and expanded more than we ever anticipated. We have received a lot of emotional support and encouragement in our efforts to provide comprehensive information, and that support continues to make us strive to make our family of websites better and better. We have dedicated ourselves to this venture and it is how we make a living out on the road. Of course, that is not possible without the support of our audience and the RV-Dreams Family. Below, we will discuss all of those in a bit more detail. However, you may click on any of the links above to go directly to that particular section. Come To An RV-Dreams Rally! We love doing our educational rallies each year, and most of our attendees leave with expanded knowledge and life-long new friendships. There are a few events each year where we are paid to speak or present seminars on the RVing lifestyle. We are asked to speak at various RV shows, rallies, and functions. Your attendance at these events supports the RV industry and allows the promoters to provide better and better consumer education. Over the last several years, we've presented seminars at the Florida RV Supershow in Tampa, FL, the Grand Rapids RV Show in Grand Rapids, MI, and several of the North Carolina RV Dealers Association Shows in Charlotte, Greensboro, and Raleigh. More recently we've presented seminars in Dayton, OH, Columbus, OH, Sevierville, TN, Atlanta, GA, Mobile, AL, Minneapolis, MN, Milwaukee, WI, Tucson, AZ, and Phoenix, AZ. For 2019, we are putting our schedule together, but we will for sure be back in Grand Rapids in January. After having good results with our initial seven-year extended warranty on our RV, we researched a variety of warranty companies. Wholesale Warranties provided us with the best quote for the best coverage, and we signed up. Since then, we have learned much more about the business and we were asked to become a referral partner. We have created a webpage that explains extended warranties, what to look for, and how to get the most out of them: RV Extended Warranties. Or if you just want to go directly to getting a quote, here is the link to our Extended Warranty Quote page or click on the banner below. 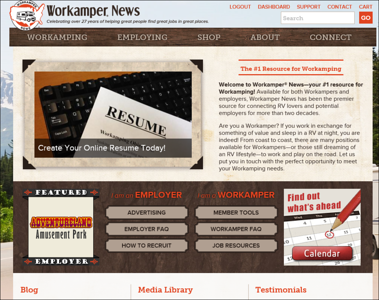 Workamper News matches RVers with jobs for RVers all across the country. Finding this website before we started full-timing road gave us the confidence that we could earn funds on the road without taking on traditional jobs. Over the years, we have worked eight different workamping jobs and still get daily email updates of open positions. We are big fans and are a Workamper News Concierge which means those that sign up for Workamper News subscriptions using our Concierge Code get an extra couple of months for free. American Adventure Insurance assisted us by reviewing all our very detailed RV Insurance Pages and they agreed to send us a small referral fee for each quote request that comes through our website. 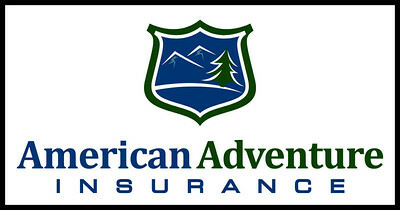 American Adventure is a national insurance agency working with several of the best RV insurance companies. And they have designated specific personnel to work with RV-Dreams readers that submit quote requests via our RV Insurance Quote Request Page. We're hearing great things about the level of service they are providing. We recommend every full-time RVer have RV-specific Emergency Roadside Assistance. The two top plans in our research over time are Coach-Net (which we have) and Good Sam Roadside Assistance. We work with Coach-Net and they have authorized us to provide discounts to our readers. Another win-win-win situation. Click on the banner below for more information. Greg & Cori are also RV-Dreams Family members that have a business they run on the road - RV Solar Solutions. 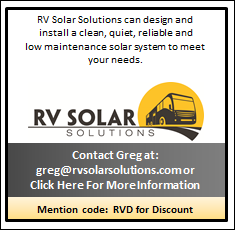 Greg has been trained by one of the best RV solar installation companies out there, and he is now a mobile solar system installer. We are personal friends with Greg & Cori, and though our solar system was installed prior to them becoming full-time RVers, Greg has done some tuning for us and we've watched him install systems at our Boondocking Rally, so we are quite comfortable recommending him. Click on the box below, and be sure to mention "RVD" or "RV-Dreams" for a discount. We have been members of Escapees RV Club since we started full-timing over a decade ago. It's one of the few RV clubs that we recommend for full-timers and we've taken advantage of many of the benefits described here: Escapees RV Club Benefits. A good number of full-timers use their mail-forwarding services in Texas, Florida, and South Dakota to establish a domicile in one of those states. There are eight Escapees RV Parks that offer great rates to members and another eleven SKP (abbreviation for "Escapees") Co-Op RV parks across the country where members can stay or even purchase a membership into the parks that are owned and managed by the members. In addition, several RV parks across the country offer Escapees discounts on nightly rates ranging from 15% - 50%. Also, the Escapees C.A.R.E. program is a wonderful idea where members can recover from injuries and illnesses, or live out their final years in their RVs eliminating or delaying the need for assisted living or a nursing home. Recently, the grandson of the original founders of Escapees started a new division of Escapees aimed toward younger RVers - Xscapers - A New Generation of RVers. Travis & Melanie Carr recently reached out to us to start a new relationship so that we can better cross-promote each other. So, we are now a Commercial Member (CM#801), and we are listed in their "Referred By:" drop-down box on their membership sign-up page. The two clubs and their benefits are basically one and the same, although Xscapers has gatherings called "Convergences" for those that prefer to be identified with the "New Generation of RVers". AND, unlike so many things these days, the Xscapers/Escapees annual membership fee has come down in price since we signed up. It's now only $39.95/year. 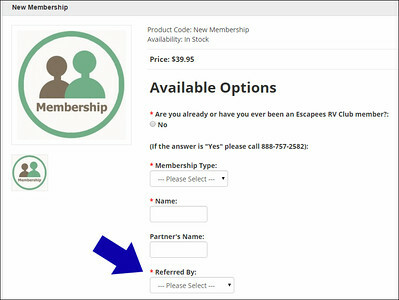 So, check out Xscapers and Escapees, and if you decide to join, please select RV-Dreams in the drop-down box on the member sign-up page. Boondockers Welcome is a website where RV enthusiasts sign up to host traveling RVers on their private property for free (or a small donation for hook-ups). You can sign up as a host for $19.95 per year or sign up as traveling member for $24.95 a year. It only takes a couple stays a year to cover the cost of membership. Frugal-RV-Travel is a website run by the same folks that run Boondockers Welcome. They have six different boondocking guides in ebook form. Click here to visit Frugal Shunpikers Guides to RV Boondocking. Harvest Hosts is a membership that allows RVers to park overnight for free at over 600 wineries, farms, breweries, museums, and more. 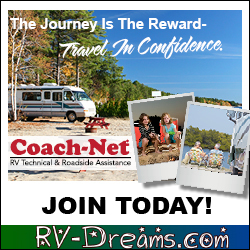 The membership is $49/year, and our RV-Dreams readers can get 10% off by clicking on the banner below and noting the coupon code at the top of the page. Shopping our advertisers and partners is one of the easiest ways to support RV-Dreams.com. We do not get any type of referral fee or commission, but these partners help us in many other ways. Some offer coupons to our readers. RVs For Less is a small, family-owned dealership in Knoxville, Tennessee. Several years ago, Butch & Karen Burson recognized that our audience is their target market. They only sell DRV Suites and Heartland Landmark luxury fifth wheels. Since our introduction, they have had a paid ad on our Journal sidebar, they bring fifth wheels to our Rallies that are in their general territory, they have taken very good care of many of our RV-Dreams Family, and they have taken great care of us by installing our flooring, our Carefree of Colorado awnings and slide toppers, our RVLock Keyless Entry, our kitchen sink, and the backsplash behind our stove. On the sales side, Butch has decided to take lower profits than other dealers in order to sell more units, so their pricing is usually very competitive. If you are in the market for a DRV or a Landmark, talk to Butch, Karen, or their General Manager, Ken Rife and see if they can fulfill your needs. MORryde International in Elkhart, Indiana produces RV trailer suspensions, including what we believe is the best suspension available for larger RV fifth wheels, the MORryde IS Independent Suspension. We had a MORryde RE suspension on our Keystone Cambridge, but eventually upgraded to the MORryde IS. Since that time, we've had a close relationship with MORryde, and they have provided seminar speakers and sponsorships for many of our Rallies. In late 2014, we had Utility Bodywerks in Elkhart, Indiana replace our damaged pick-up bed with one of their aluminum Elite RV Hauler Beds. They worked with us on the price in exchange for some advertising and promotion. Well, we love the hauler bed and wish we would have gone in that direction years ago. So, we are happy to promote it. In fact, we have a whole webpage dedicated to it that includes a video of the features and storage. There is also a coupon for $250 off a hauler bed. Check it out here: Our RV Hauler Bed By Utility Bodywerks. In late 2013, with our fifth wheel getting close to nine years old, I started looking at some of the spray-on RV roofs on the market. Ultimately, I settled on RVRoof.com in Green Cove Springs, Florida. It's a small company where the owner had developed his trademarked FlexArmor roof specifically for RVs. We didn't yet have a need for a roof as we didn't have any leaks, but I liked the idea of a seamless roof that would require much less maintenance and that would be guaranteed as long as we own our RV. Plus, we wanted to see if it was something that we could recommend to our audience. Now, it's much too early to tell in the overall life of a roof, but so far we're quite happy with it as are several others that have gone to see David & Jennifer at RVRoof.com. Now that we've sold our fifth wheel, we won't be able to give a long-term review, but we'll still be looking at this roof for the motorhome in the future if we start having issues. In the summer of 2014, our friends at RVs For Less asked us if we would be interested in being a field tester for a new product. We agreed and had a test unit of the Truma AquaGo installed. The AquaGo is a "tankless" water heater that provides unlimited hot water without fluctuations in temperature. We tested it, loved it, and then attended the 2014 RVIA show in Louisville where we were embraced by the Truma family. Truma is a German company, named after President Harry Truman, that has majority market share of various RV components in Europe. We were impressed both with the product and the company's willingness to listen to us consumers. Also, there is an Owner Rewards Program. As an owner of an AquaGo, we can offer you a coupon (below) that will allow you to receive a $50 Visa gift card after you have purchased an aftermarket AquaGo. Once you have registered your product warranty, you can get your gift card AND you can create your own coupons to give out. 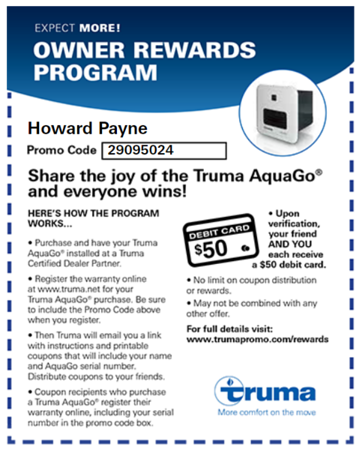 When one of your friends purchases an AquaGo, both of you will receive a $50 Visa gift card. Just copy and paste the coupon and save it on your computer for future use. We have established a relationship with another small, family-owned, family-run business in Shipshewana, Indiana - Lambright Comfort Chairs. Vernon Lambright is committed to building quality furniture and it has become a popular option for many RVers. Vernon doesn't have a website, but we've done a couple of write-ups on our visits there. You can check those out and access a 5% off coupon here: Our 2014 Visit To Lambright Comfort Chairs and Our 2015 Visit To Lambright Comfort Chairs. Here's another one. In 2018, after we sold our fifth wheel and bought the Winnebago Aspect Class C, Vernon took our our dinette and replaced it with theater seating. You can read more about that here: Dinette Is Gone, Lambright Theater Seating Is In. You can also get the 5% coupon from that post. RV Driving School is owned by George & Valerie Mayleben who we have recently started including as part of our Educational Rallies when their schedule allows. At our Rallies, George presents a couple of seminars and they try to have a driving instructor on site to provide hands-on driving lessons before and after the Rallies. They have been a great addition and they offer a very nice discount to those from our RV-Dreams Family. Full-time RVers Chris Dunphy & Cherie Ve Ard run the website RV Mobile Internet Resource Center. There is a reason we don't try to maintain an "Internet On The Road" page on our website - it's too much work and the technology is ever-changing. So, we rely on Chris & Cherie to keep us updated and informed. They frequently answer questions on our RV-Dreams Community Forum, and I just tell folks to buy their book - The Mobile Internet Handbook - and subscribe to their email updates. They save me a lot of work and a lot of time and money, and they will probably do the same for you. 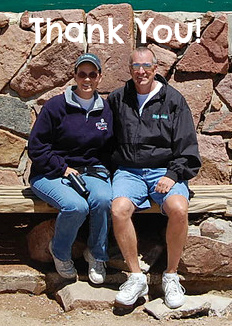 Full-time RVers, Jack & Danielle Mayer have been at this RVing thing much longer than us. Jack reached out to us early on in our adventure, and he became our "technical mentor" voluntarily giving us much of his time. As the years have passed, we've become great friends, and he is still one of the best resources for full-timers, especially on the subjects of RV electrical and solar, RV communications technology, and towing with Heavy Duty Trucks. He wrote a chapter for the above-mentioned "Mobile Internet Handbook" for Chris & Cherie. In addition, Jack & Danielle are Ambassadors for New Horizons RV. Jack is also a frequent contributor on the RV-Dreams Community Forum, and we can't tell you how much his advice and counsel have meant to us over the years. This is one of our newest relationships. Lee & Tracy Perkins are full-time RVers that recently attended one of our Educational Rallies and started their own journey on the road. Lee is a professional in the video business, and he has taken his passion and created Open Road Video as a source of income in their new lifestyle. Lee shot footage at our 2015 RV-Dreams Reunion Rally, and he shot, produced, and edited the video you see on our RV-Dreams Home Page. In addition, he is working on more videos for us and will be at our 2016 Rally to shoot even more as we work on getting our website into the video age. Tracy is an experienced business consultant who helps Lee on the business end while she is establishing her own, new consulting business. 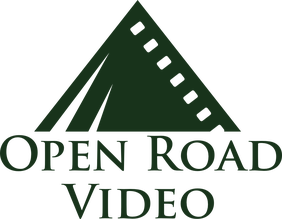 The services of Open Road Video won't be something most of our readers will want or need, but we had to include them here as part of our effort to work with and promote full-time RVers with mobile businesses. Of course, if there are those of you out there that are interested in what Lee can do, this blurb on their "About" page says it all: "he has a knack for creating the big budget look you want without breaking the bank". The folks at Google long ago established Google AdSense for web publishers. AdSense is a way for website owners to place ads on their website without having to solicit advertisers to pay for ad space. Basically, anyone with a website can establish a Google AdSense account for free. Once an account is established you can customize colors and sizes of ads as well as a few other items. Then all you have to do is copy the HTML code Google provides and place it in whatever location you choose on your website. Many blog services and website building services have "Help" sections that provide instructions for placing Google Ads. Once the code is in place, Google scans your website for content and places "content relevant" ads in the ad blocks. It may take a little time for relevant ads to show up. Often, immediately after posting a Journal entry, we end up with ads that we have no control over and don't like, but they eventually change as the information on the page is scanned and re-scanned. If we get objectionable ads over and over, we have the ability to block those URLs within our Google Adsense account. So how do you make money with Google Ads? Well, Google has another program they call AdWords. It's somewhat complicated, but basically advertisers pay Google to place their ads on websites that are relevant to the product or service they are selling. Those advertisers also pay Google based on the number of clicks on their ads. When you own a website with Google Ads, you get paid a small percentage of what Google gets paid, pennies at a time, for each click on an ad on your website. If you have enough traffic and enough people click on the ads they are interested in, you can earn some decent income from Google. Even if you don't have a lot of traffic, once the ads are there, there is no maintenance and even a few dollars a month helps, right? Now, Google has some very strict policies to protect their AdWords customers. If those advertisers end up paying a bunch of money on a bunch of bogus clicks, then the system will fail. So, Google will terminate your Google AdSense account if 1) you blatantly tell your audience to randomly click on Google Ads, and 2) if you click on your own Google Ads. So, that's why you will never see us tell our readers to just click on ads. We occasionally remind folks to look at all of our "sponsors", but we absolutely cannot encourage clicks. The restriction to click on your own ads is also why we, and other RVers that have wireless hotspots and websites with Google Ads, keep our internet access secure. If someone sharing your internet access clicks on your Google Ads, it can look like you are clicking them yourself and you can be terminated. And it's not easy to get reinstated. Affiliate ads are also ads that you can add to your website for free. The difference between affiliate ads and Google Ads is that while you get paid for clicks with Google Ads, you don't get paid with affiliate ads unless a purchase is made or a lead is generated (perhaps the completion of an application or online form). The percentage you get paid is much higher, but the percentage of people that click through your website and buy something is very, very small. Many, many online businesses that sell products or services have affiliate programs. Look at the bottom of the home pages for links that say "Affiliates" or "Partner With Us" or something to that effect. Usually, not always, but usually, the online businesses run their affiliate program through an affiliate manager like Commission Junction (now CJ Affiliate), Clickbank, LinkShare (now Rakuten), and many others. If you want to be an affiliate for a certain business, you click on their "Affiliate" link. Most often you have to sign up with their affiliate manager and complete an application through that affiliate manager. Sometimes your application is "rubber stamped" and you can place affiliate ads immediately. Other times, your application really does go through an approval process and it may take a little time for an approval. And sometimes, your application will be rejected due to 1) not enough traffic on your website, or 2) your website doesn't fit the product or target audience of the business/product. Like Google Ads, you will be instructed how to locate ads and you may have lots of choices. Once you decide on the ad you want to display, you copy the HTML code and place it where you want it on your website. Then you wait. How do you get paid? Well, as I said before, you only get paid with affiliate ads IF your website visitor clicks on the ad on your site AND either buys something or becomes a "lead". Here's the good news. They don't have to buy something THAT day. A cookie gets placed on your website visitor's computer, and it remains there and valid for a certain period. That period may be a few days or several months (depending on each specific company's policy). If your website visitor thinks about it and goes back to the online business later and buys a product, you can still get a commission. The affiliate manager compiles your commissions and sends them to you by check or direct deposit. Usually, you have to accumulate a certain threshold of commissions before a payment is sent. Commissions are usually paid once a month. Now, the percentage of website visitors that click on ads of any kind is very small. And the percentage of website visitors that click on ads AND actually buy something is much, much smaller. So it takes a lot of traffic to make any serious money with affiliate ads. That's why Google Ads are more attractive to sites with limited traffic - even though the "per click" payments are small, there are more of them. Anyway, if you see an ad on our websites that are NOT Google Ads, chances are they are affiliate ads or paid ads. You can click away on those. :) And if you happen to buy something, we will at some point get some type of commission. Amazon.com has its own "affiliate" program that they call Amazon.com Associates. It's pretty easy to set up and is also free. You can include links to Amazon in general, set up ads that will be populated based on key words you provide, or you can place ads for specific products. There are lots of options. Again, you only get paid if your website visitor buys something after clicking through the ad on your site. Most small website owners have very little success with Amazon ads. The commissions are low, especially for books. However, a wide range of people buy lots of products on Amazon.com, so there is potential. Although it is still one of our least successful strategies, we have had a little more success because many of our readers are simply using our Amazon links (like the search box below) to get to the site for items they were going to buy anyway. They don't pay any more, but because they accessed Amazon through our site, we get a small commission. Every link to our site helps. Not only does it bring others to our site, but it helps our rankings on search engines. We have several options for promoting your site and doing cross-links if you wish. We are all about mutually beneficial relationships. Use our Contact Form to send us information if you would like to work together. Many of our website visitors do this already and that word of mouth is greatly appreciated. Mentions on other forums and in blogs and emails have brought numerous new people to RV-Dreams.com. So, we want to say "Thank You!" and we cannot emphasize enough how helpful that is and how much it means to us. In addition to our Journal (blog), we have an RV-Dreams Facebook page and an RV-Dreams Twitter page. Now, we'll have to admit we really don't understand Twitter very well, so we have it set up so that links to our Journal posts are posted to Twitter automatically when we post them to Facebook. And that's pretty much all we do with Twitter at this time. If you know of businesses that have products or services of interest to the RV-Dreams.com audience, please let us know via our Contact Form. Over the years, we have sold many products. And we currently have a supply of RV-Dreams logo hats, visors, insulated tumblers, bumper stickers, static cling stickers, and more. However, we stopped offering those for online purchase, simply because the shipping costs are too high and we don't feel right about charging the amounts we would need. So, we now only sell (or give away) our logo items at our Rallies. Please know that all support of any kind is greatly appreciated. Part of living our dream is to help others live their dreams. You help make that possible.